Our caddies bowed to us, and we realized they were not like the gravel-voiced, slouch-capped lads who lugged our bags in Scotland and Ireland. We were in Vietnam, a country riding a wave of newfound prosperity and embracing the golf addiction that is sweeping Asia. Female caddies were de rigueur. 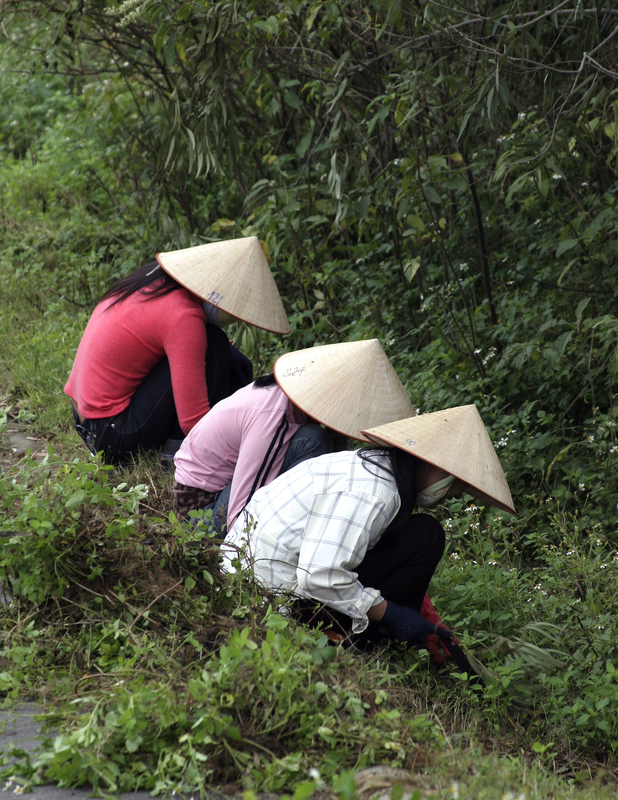 Nguyen and Ha were swaddled in loose-fitting uniforms topped with wide-brimmed hats. (Only lowly field hands have tanned skin in this culture.) The young women were diminutive, with pleasant faces and big brown eyes that danced at the prospect of caddying for two American women golfers. Using a few words of English and lots of gestures, they were soon clubbing us accurately, lining up our putts, and giggling softly when we praised them. The course was Chi Linh Star Golf and Country Club, a 2003 addition to Vietnam’s growing golf complement, and arguably its best. 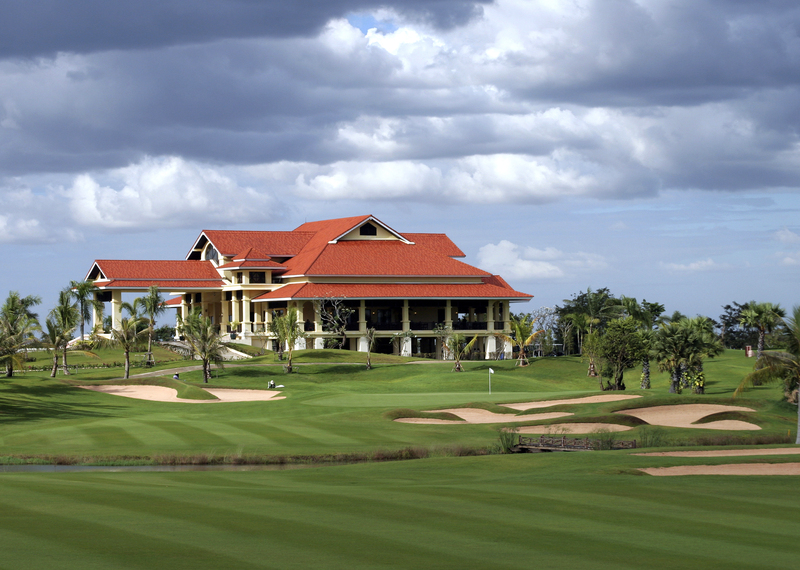 It reflects the new wave of golf in Vietnam, with its modern, glass-fronted clubhouse; fleet of golf carts with caddy platforms; and contemporary layout by an Australian design firm. Verdant and diligently maintained, the course is a captivating shot-makers’ test incorporating a multi-fingered lake and the steep hills around it. Eighteen more holes open this year, followed soon by a five-star hotel. The club is an hour east of Hanoi, on our route to scenic Ha Long Bay, a UNESCO World Heritage site. By nightfall we were aboard the French-inspired Emeraude, sailing among the bay’s monolithic islands and colorful floating villages. Our Vietnam odyssey had begun in Ho Chi Minh City (HCMC, formerly Saigon), an international gateway and center of business and culture that is home to more than six million people. In the Saigon Saigon Bar on the roof of the historic Caravelle Hotel, we sipped cocktails under the gentle swish of ceiling fans. Thirty years ago, war correspondents gathered here to watch artillery fire light up the night sky. On the outskirts of HCMC we played the 36-hole Vietnam Golf and Country Club, a gently rolling venue carved from a former cashew plantation. Though both layouts are relatively flat, the tiered, aggressively bunkered greens proved humbling, and we wilted as the temperature topped 100 degrees. The heat eased slightly as we headed 120 miles north to Phan Thiet, a fishing village/resort area. The beachfront Novotel Ocean Dunes & Golf Resort has large, modern rooms and Sinatra tunes floating through the open-air lobby, but we knew we were not in Miami when we passed the remains of a Buddhist temple on the Nick Faldo-designed golf course. Wind gusts up to 60 knots swirled among the dunes and lotus ponds, making the narrow fairways seem to shrink. Hole nine, a knife-thin oceanside par three, has been among Golf Magazine’s best 500 holes in the world. Heading north and inland, we followed a mountain road into the highlands, 5,000 feet above sea level. We were immediately enchanted by the former French hill station that is now the village of Dalat, called the “city of eternal spring.” Temperatures top out at 80 degrees, and the crisp air carries the scent of the flowers, which are everywhere. At the center of town, on a hill overlooking a large lake, is the Sofitel Dalat Palace Hotel, built in the 1920s. Its exterior received an Art Deco makeover during WWII, but inside it’s pure Victorian, with huge, high-ceilinged common areas and sumptuous suites lit by chandeliers. The country’s first nine-hole golf course was built here in 1922 at the instigation of the last emperor, Bao Dai. When he was exiled, the course fell into disuse, but it was revived in the mid-1990s and expanded to 18 holes. A punishing, 7,000-yard track with long water carries, sharp elevation changes and slick greens, it rewards with dynamic views of the lake and countryside. The three courses we played exemplify Vietnam’s diverse terrain and limitless possibilities as a golf destination. There are only a dozen courses here now, but many more are in the works. We caught a 60-minute flight from HCMC to Siem Reap in neighboring Cambodia, which also expects golf to broaden its appeal to tourists. Most visitors come here for the Angkor temples—vast, intricately hand-carved stone structures built by Khmer kings between the ninth and fourteenth centuries. The 77-square-mile UNESCO World Heritage site lies just outside the town of Siem Reap, where the legendary Raffles Grand Hotel d’Angkor has housed affluent guests for 75 years. The hotel’s original lift, a small cage operated by a uniformed lad, took us to the second floor and our sumptuous rooms overlooking the enormous swimming pool. The spa faces one side of the pool, and a new wing faces the other. The first morning, we enjoyed an early breakfast on the terrace above the pool before meeting a guide for our first visit to the Angkor park. It was a special moment. For many years I had studied old guidebooks with black-and-white images of the temples and the historic hotel, and anticipated the experience. Raffles Grand Hotel d’Angkor did not disappoint. It was like stepping back into one of those old black-and-whites–but with modern amenities. A bit farther down the main street from Raffles is the Sofitel Royal Angkor Golf & Spa Resort, a sprawling complex of buildings in a garden setting. 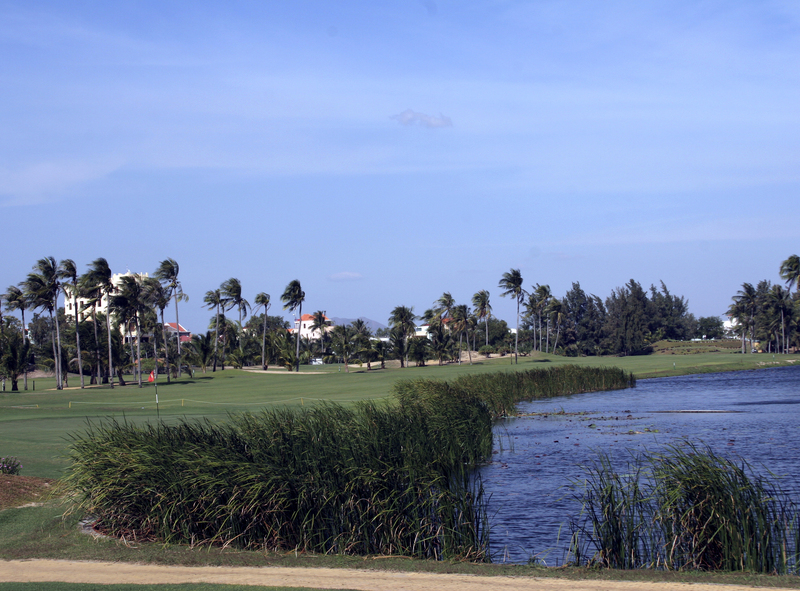 The hotel made history in 2006 with the opening of the $10 million Phokeethra Country Club, the country’s first international caliber golf course. Every morning we rose before dawn to beat the crowds at the temples, and one afternoon we caught a Sofitel shuttle to the golf course, passing scores of tuk tuks—the ubiquitous two-person carriages propelled by motorbikes. We were met on the clubhouse steps by smiling young women bearing icy towels and goblets of cold lemongrass tea. Aided by two more lovely caddies, we ran a gauntlet of water hazards and diabolical bunkers, loving every minute. The grooming was so perfect, and the colors of the grass, water and sand so vibrant, that the course seemed surreal. We paused just beyond the ninth green at an 11th-century bridge juxtaposed against the modern clubhouse, taking time to savor the time warp. Moments like that were what brought us to southeast Asia, and will bring us back again. If You Go: United Airlines is the only U.S.-flagged carrier with direct flights between the U.S. and Vietnam. Seven flights a week from San Francisco and Chicago fly to Ho Chi Minh City (formerly Saigon).